Patios open up a number of outdoor gathering and entertainment options, providing homeowners with a huge advantage both in terms of home equity and personal enjoyment. Here are a few reasons why a patio might be an excellent choice for your home. A home without an outdoor space can sometimes seem too limited, and when the weather outside is perfect for outdoor fun, that can be a real drag. An outdoor patio can make your home seem much less crowded during gatherings, while allowing homeowners the chance to escape cabin fever and get outside for some untethered fun! The last thing anyone wants to do on a hot summer day is crank up the oven and heat up the house while cooking a meal. With an outdoor patio, it’s fun and easy to move the cooking outdoors to a grill or outdoor fireplace, so the heat can stay outside where it belongs. A simple patio installation creates a perfect place for your outdoor furniture, so you can enjoy the weather without increasing your indoor cooling bill. When the weather is just right, there’s nothing better than being able to entertain friends and family outdoors. 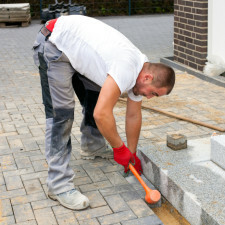 Installing a patio is a great way to bring the party outside. People spend so much time, energy and money designing and growing beautifully landscaped gardens and lawns, but will often overlook the need to build a space from which to admire them! An outdoor patio solves that problem by allowing homeowners to share the fruits of their labors with friends and family. Charlotte deck builders can help you sort out all the options. So is now the right time of year for a new patio?